Explanation: On Monday morning, Venus and Jupiter gathered close in dawn skies, for some separated by about half the width of a full moon. 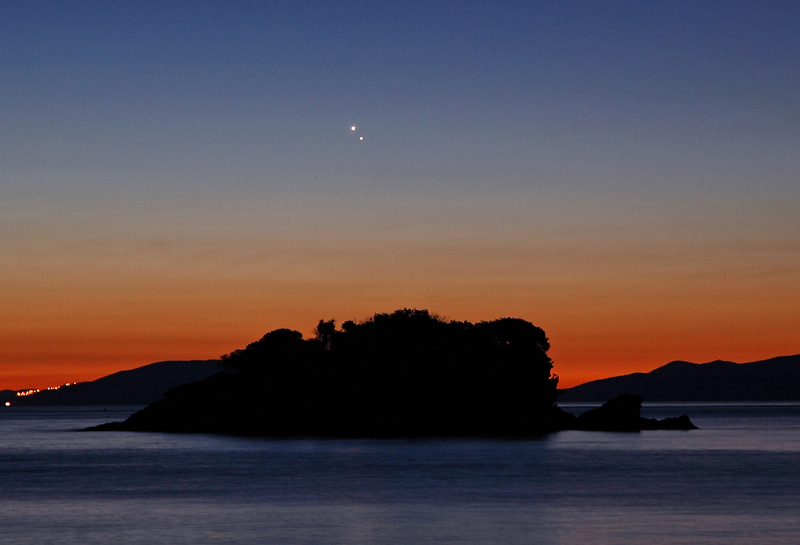 It was their closest conjunction since 2000, captured here above the eastern horizon before sunrise. The serene and colourful view is from Istia beach near the city of Capoliveri on the island of Elba. Distant lights and rolling hills are along Italy's Tuscan coast. Of course, the celestial pair soon wandered apart. Brighter Venus headed lower, toward the eastern horizon and the glare of the Sun, while Jupiter continues to rise a little higher now in the sky near dawn. The two brightest planets meet again next June 30th, in the evening twilight above the western horizon.